Boise is the capital and most populous city of Idaho (the 104th largest city in the nation), and is the county seat of Ada County. 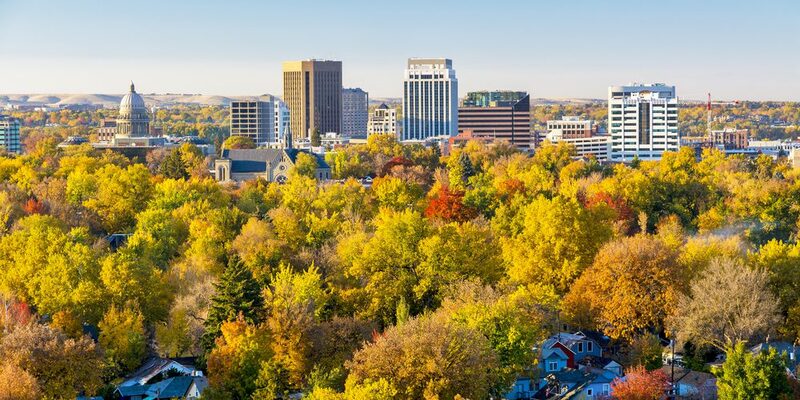 Boise is the largest city between Salt Lake City, Utah and Portland, Oregon. Boise’s population was 205,671 in 2010. The metropolitan area population is approximately 616,000 people and is the third most populated area in the Pacific Northwest. Looking for a home in Boise? Check out the links below to search the MLS for real estate by price range or by subdivision. Like many other cities, Boise has different areas, each with their own character, special qualities and events. Whether you are looking for a home with land, brand new construction or a home with a view, there really is something for everyone in Boise. Downtown Boise – Downtown Boise is the cultural hub of Boise. This area houses many unique business and events: the Boise Twilight Criterium bicycle race occurs in July each year; the Capital City Public Market is an ongoing gathering place where farmers and producers gather to sell their products to the public. North End or “North Boise” – The North End of Boise is extremely popular because of its location and maturity. It is close to downtown and the foothills, which allows easy access to mountain biking, skiing and snowboarding and hiking just to name a few. As it is one of the oldest parts of Boise, there are many older homes with a rich history. Although many homes are older, in recent years there have been “infill” projects (new construction among the existing homes) as well as many North End homes that have been remodeled. Some notable sections of the North End are the Camels Back Park, Hyde Park and Harrison Boulevard. There are many events that take place in the North End such as the Hyde Park Street Fair and Art in the Park. The price range in the North End ranges anywhere from $100,000 to over $1,000,000. Northeast Boise – If you are looking for newer construction but still want to be close to downtown and recreation then Northeast Boise might be an ideal location. Newer communities such as Harris Ranch, Solaire, River Heights, Triplet Ranch and El Paseo. This area of Boise allows for great recreation including biking or walking on the Boise Greenbelt, floating the Boise River from Barber Park, checking out a play at the Idaho Shakespeare Festival or boating at Lucky Peak Reservoir. Northeast Boise homes broadly range in price from $135,000 to well over $1,000,000. Southeast Boise – There are a variety of subdivisions, communities and neighborhoods that offer convenient access to both downtown and other areas of Boise. Communities like Columbia Village and Surprise Valley offer great amenities for families like tennis courts, pools, clubhouses and walking paths, as well as access to biking and hiking. Bown Crossing is another unique development in Southeast Boise which offers a great mix of single family homes, patio and town homes, condos, retail and restaurant space. Home prices in Southeast Boise range from anywhere $90,000 to $950,000. Boise Bench – The Boise Bench derives its name because of it appearance, since its elevation rises about 60 feet above downtown, giving the appearance of being a step or bench above the city. Many homes in this area are older, similar to that of the North End. The Bench offers close access to the freeway, downtown Boise, the Boise Airport, Boise State University, shopping and restaurants. The Boise Train Depot, which was built in 1925, is a major landmark in Boise. The grounds of the Depot host many picnics, weddings and photography sessions. Home prices for the Boise Bench range anywhere from $55,000 to well over $500,000 for a home with a view. South Boise – South Boise is an ever growing residential area with a lot of new construction as well as existing homes. If your property requirements are a shop or acreage, this area should definitely be explored as it offers larger home sites when more property is desired. This area offers great entertainment with easy access to Edwards 21 movie theater and numerous restaurants. Easy freeway access allows for a great commute to anywhere in the Treasure Valley. Home prices range from $90,000 to $400,000. West Boise – West Boise includes both new and existing residential communities, restaurants, strip malls and the Boise Towne Square Mall, which is the largest mall in Idaho. The area also includes many major retailers such as Barnes & Noble, Cabella’s and Best Buy. Freeway access allows for a 10-15 minute commute to downtown Boise. Home prices range from $70,000 to $400,000. Northwest Boise – Northwest Boise sits against the Boise Foothills and contains both new and old neighborhoods. Some of the older residential areas have a feel that is similar to the North End, which is appealing to many. This area offers easy access to the biking and hiking of the Foothills, as well as the Boise Greenbelt. Home prices range from $100,000 to well over $1,000,000 for a custom built home in the Boise Foothills. One of the benefits of owning real estate in Boise, Idaho is the surrounding environment. There are numerous recreational opportunities in Boise, which include extensive hiking and biking trails in the Boise Foothills. The ever changing landscape along the Boise Greenbelt, which runs along the Boise River, makes for awesome walks or bike rides anytime of the year. 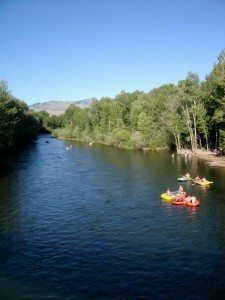 The Boise River is also great for fishing, swimming and rafting, which is a popular activity in the summer months. Many of Boise’s parks are located along the Boise River, which creates a stunning backdrop for a family picnic or walk. The popular parks along the river are Ann Morrison Park, Katherine Albertson Park and Julia Davis Park. There are other parks located in Boise that have a great deal to offer, such as Camel’s Back Park which is located in North Boise. While it isn’t a park, another fantastic outdoor place to visit is the Idaho Botanical Gardens, which has a huge assortment of plants and many speciality gardens. The Idaho Botanical Gardens also host many concerts and events throughout the year, including the Winter Garden Aglow Festival during the Christmas season which is a must see. If you are someone who likes to be in a park like setting while hitting golf balls you are in luck because Boise has 8 fantastic golf courses. There are additional courses throughout Meridian, Eagle and Nampa if by chance you are up for a change of scenery. 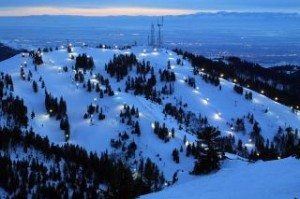 When you ask most people who live here why they love it, most will respond with “because we have four seasons.” In addition to the activities in the foothills and along the river and the various cultural activities in the city, Bogus Basin gives Boiseans a chance to ski, snowboard and tube in the winter months. Bogus is a 165 acre snowy paradise conveniently located just 16 miles North of downtown Boise. Other ski resorts in the area are Brundge Mountain Resort (about 2 hours away from Boise) and Sun Valley Resort (about 3 hours from Boise). If activities like hunting, fishing and camping are more your style, Idaho will not disappoint. Many reservoirs, camp sites and hunting areas are located within a convenient distance from the Boise area. Lucky Peak Reservoir is located anywhere from 20-45 minutes from Boise depending on your beginning destination. Other lakes around the area include Anderson Ranch (20 miles E. of Mountain Home), Arrowrock (20 miles E. of Boise), Brownlee (N. of Weiser, Idaho). Beautiful Lake Cascade (about 2 hours from Boise) and Payette Lake (about 2 1/2 hours from Boise) are located North of Boise and are popular destinations all year round. When you begin looking at all that Boise has to offer, it is no surprise that some large corporations call Boise their home including Micron Technology, Albertsons, Boise Cascade, Bodybuilding.com and J.R. Simplot Company. Numerous other high tech companies such as Hewlett Packard and Crucial.com also have locations in Boise. In addition to technology, the traditional resourced-based industries like agriculture, forest products, and mining continue to contribute to the economy. Other areas of business growth in the area include healthcare, tourism, business and information services. Comparing the state of Boise’s economy compared to that of other regions around the country that were hit extremely hard by the mortgage crisis, our economy and real estate market are doing well above average. In fact, the Brooking Institute’s December 2011 report indicated that Boise was second in the top 20 metropolitan areas for economic performance. All in all, Boise is a fantastic place to live, work and play!